The tightening of medical device regulations in China shows that access to its vast market opportunities demands watertight accountability for product safety and effectiveness from foreign suppliers. Understandably, China will not be used as a “dumping ground” for cheap medical devices from sub-standard manufacturers. 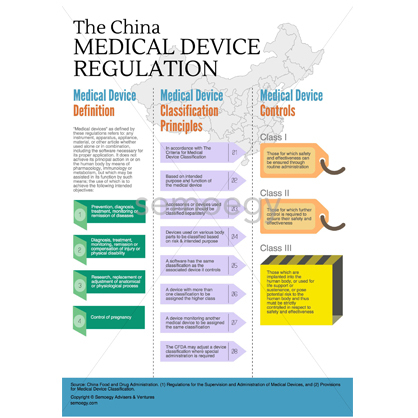 However, China’s recent move to make its medical device regulations overly complicated is causing a buzz of consternation to reverberate throughout international medical device communities. On the other hand, if the US FDA already has one, why not China? The problem is implementation of the ironclad regulatory framework moves too quickly ahead of any plans to promote its comprehension. The lack of transparency, education or adequate period for transition throws a spanner at China-entry plans for many foreign medical device manufacturers. If China does not manage this well, the spanner may boomerang back to crack its own great regulatory wall. Here are some reasons why. Firstly, the required resources and responsibility to manage a rigorous medical device regulatory program are tremendous. Accountability for product safety should fall equally on device manufacturers and the regulators. Unlike pharmaceuticals, there is greater variety in medical device technology and a diversity of therapeutic functions. The review process involves an amalgamation of knowledge, judgment, opinions, experience and decisions of a multi-disciplinary team. This team and organisational structure must be large and efficient enough to maintain productivity levels that meet regulatory timelines. Without this, a high medical device submission to regulatory team ratio will cause review timelines to stretch and lead to an insurmountable backlog. Clearly, prohibitive medical device regulations create barrier to entry for foreign healthcare technology. China’s answer to this is to focus efforts on local medical device innovation and push for purchase of local healthcare technology. While all this is well and good to control product costs and ensure self-sufficiency, China must realise that the rest of the world is making advancements in healthcare through international collaborations and benefiting from headways made by foreign medical device technology. Maintaining an equitable medical device regulatory framework for both foreign and local manufacturers ensures a healthy interaction of technology and ideas indispensable to spawn innovation. If China shuts this door, China will end up innovating only for China and miss opportunities to match with world-class standards in medical device technology. Another repercussion of deflecting foreign medical device brands is loss of market competitiveness. Undoubtedly, regulatory review can be tightened for local device manufacturers to boost quality standards. However, compliance is bound to be an expensive process and cost escalation may be inevitable. The lack of choice also means that hospitals could be subjected to monopoly by a handful of successful local brands. While brand monopolies are not new in the medical device industry, deterring one in order to build another may not be the best strategy to accomplish cost containment. Depending on the intended use, not all medical device technologies can build economies of scale to enjoy cost reduction. Besides, depriving access to alternative or supplementary medical device technologies could even be life threatening to patients. Is the China FDA mirroring the US FDA? It may not be wrong to suppose. Some semblance of harmonisation is good, but harmonisation is only effective if it is present both in the rules and in their administration. For one thing, the US FDA applies the same framework for both local and foreign medical device manufacturers. In considering the positive and negative consequences of the stringent US FDA-type regulations, China could be expected to produce an improved regulatory model, perhaps one that is a hybrid of the US FDA and the European Union frameworks or one that eliminates serious device failures altogether. Such regulations require time for deliberation and collaboration with industry. On the other hand, the China FDA may forge ahead of the US FDA and the EU in assessing post-market activities through unannounced audits, enhanced adverse events monitoring and random product testing. For this reason, China’s medical device regulations may be ironclad and muddled with economic objectives. However, there is no doubt that its pursuit for medical device safety is bona fide.